Screencastify is a screen recording tool used to inspire people to create video content, however they’re seeing an alarming number of uninstalls on their plugin, and people who visit their website for information are unsure of what the product is or how to use it. Contextual Observation played a huge roll in our research because it helped us understand why people were uninstalling the plugin after downloading it. It also let us see the emotions and thoughts of first time users as they walked through the website to get an understanding of what the product was. We were able to get their feedback on if the website enticed them to become a lite or premium user, how they felt about the price points and if this was a product they could use. 1. People aren’t using any screen recording tools in their everyday lives for personal use as they don’t know what value they can get from it. 2. Users won’t upgrade unless they find value in the product, its features, and are using it on a consistent basis. 3. Users aren’t sure how to use the product after on-boarding, and feel that the permission process lacks transparency. 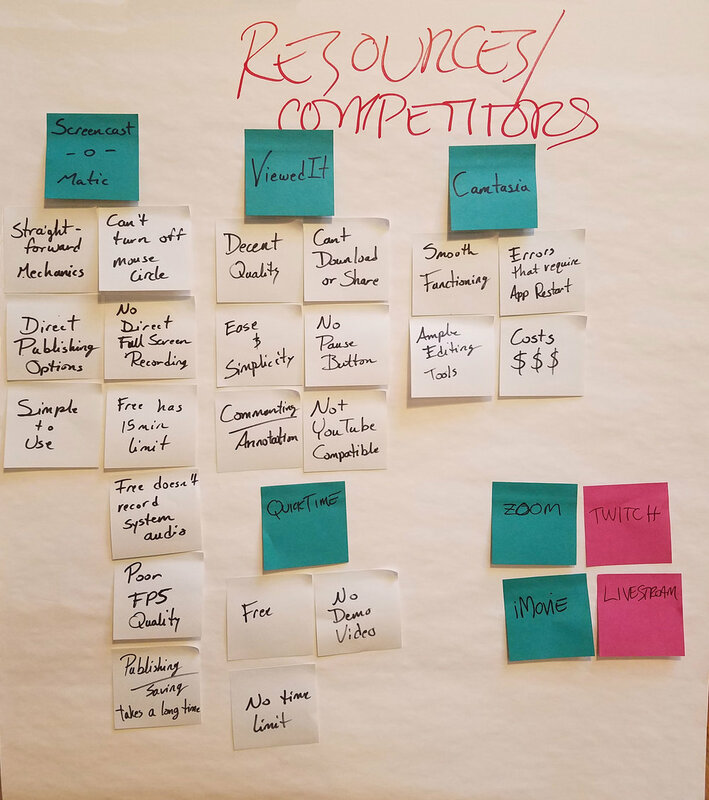 After gathering our research, we began affinity mapping and identifying core Screencastify users. We also looked into behavioral patterns for screen recording users across the board. For each user, we narrowed down our research to the top 3 reasons that drove their interest. Users won’t upgrade unless they find value in the product, and still aren’t sure how to use the product after on-boarding. • Communicate the value of a screen recorder to everyday users? • Inspire people to use a screen recorder tool? Based on our research findings, we divided up the deliverables and began creating concepts. One was a full redesign of the current website, and the other was a redesign of the on boarding in the Google Chrome extension. As a team we sketched ideas for how we could tackle this and voted on the best concepts. With this, I was responsible for educating and inspiring customers as soon as they arrive on the website. I also worked on a concept for creating a need for the tool after the videos had been created. I took a look at some of our competitors to understand what they were doing right, and what could be done better. I found that they put a lot of emphasis on downloading the product, but didn’t do a good job of explaining what it is and who it’s for. I wanted our product to stand out among competitors, but most importantly I wanted to adhere to our design principles. Since the main goal of our project was to inform, educate and inspire, I created a few different versions and conducted user tests to see which design best achieved that. I took a dark approach to my first design. I used a black overlay on the images so that the text would be a focal point in white. I wanted to add color so I went with the took a similar approach to the previous design but in white. I wanted to give the images a lighter effect to see if it felt more inviting. I also incorporated orange for a pop of color to help guide eyes throughout the page. Here I wanted to combine my first two looks by adding color to the black version. This also turned out to be a better way to differentiate the use cases at the top of the page. For my final design, I decided to combine all three of the versions I created. I wanted the site to feel exuberant, but still have a sleek look. I approached the layout for the website keeping in mind our design principles of inspire, educate and motivate. I wanted people who landed on the site to immediately know what Screencastify is, and how it could work for them. Without having to scroll or click around for more information, I wanted the site to instantly draw people in with its imagery, color, and language. These wireframes are my initial approach at that. My team and I worked together to produce mockups. Below are the screens I created. Leading a team of four with design direction and execution helped us meet the demands of our client in the full redesign of the website. We met the deadline for the redesigned website and chrome extension going from conception to delivering a final product in three weeks. Having a solid understanding of the users needs for a screen recording tool was made possible with thorough research before design. This contributed to the success of this project in that we were able to come up with use cases and display them on the website to educate, inspire and motivate people to use the product. Having identified where Screencasitfy falls in the market of similar products, we called out many of their free and premium features on the homepage of the website and how they can benefit various use cases.